When designing this delectable 18k White Gold Love Ring, the jewelers at Cartier took inspiration from their world-famous Cartier Love Bracelets, while simultaneously imbuing this piece with its own uniquely luxurious touches. 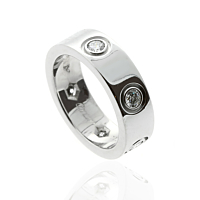 Eschewing the alternating Chastity Belt-inspired screws which feature prominently on many Love Collection pieces, this Ring features a full 6 VS1 Clarity E Color Round Brilliant Cut Diamonds spaced out evenly around the exterior of the band. A truly timeless piece!